Hadi Sarieddine, the talented guitarist and founder of Benevolent, has released his newest in a series of dark/ambient covers, but this time it is The Weeknd‘s song, Can’t Feel My Face (not even a rock/metal song to begin with). As expected, the cover is full of energy and life, and in my opinion, is much better than the original. Hadi has done over ten ambient covers before, from Katatonia to Deftones, and has now moved on for the first time beyond metal and rock songs, taking a commercial R&B song and making it into something truly worth your time. His cover before last gained widespread recognition, enough to gain a share on the band’s official Facebook page. 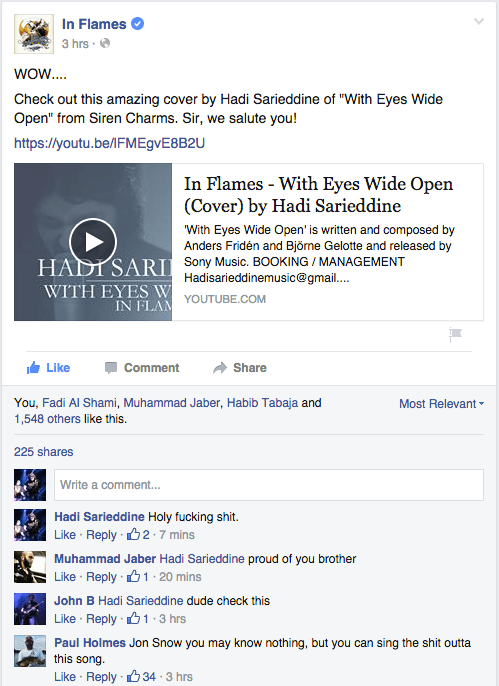 “With Eyes Wide Open – In Flames” everybody! Support Hadi by subscribing to his YouTube Channel, and/or by buying Benevolent’s album. The cover was recorded at Haven Studio.